Google tests a feature that will let you lock the SafeSearch settings on a computer. Currently, the SafeSearch settings can be easily changed from the preferences page, the advanced search page or by editing a Google search URL. "Many users prefer not to have adult sites included in search results (especially if kids use the same computer). Google's SafeSearch screens for sites that contain explicit sexual content and deletes them from your search results. No filter is 100 percent accurate, but SafeSearch should eliminate most inappropriate material." To lock SafeSearch settings, you'll need to log in using a Google account and select the locking option from the preferences page. 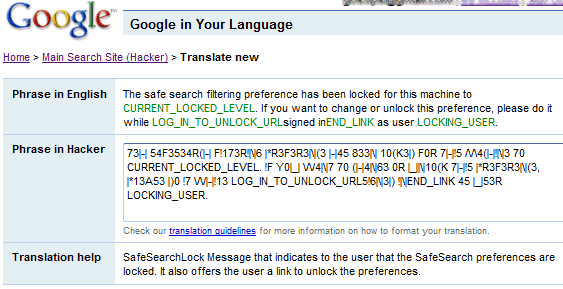 "Use this page to lock the SafeSearch settings selected. The lock takes effect when you sign out. 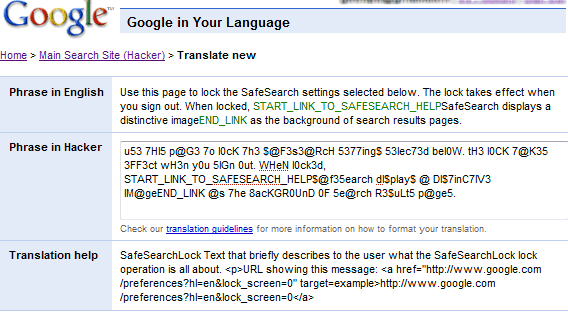 when locked, SafeSearch displays a distinctive image as the background of the search results pages," explains Google. How does one gain access to this capability? I can't find it in my Search Preferences when I'm signed in to my Google account. My question is out of topic, but the relevant blog is too old, so kindly excuse me. I wanted to know who exactly accepts the invitation when an ADD friend request is sent to partychat@gmail.com Thanks a mill! I have looked on two browsers (Firefox, Opera) & do not see this option. What I did see after enabling Strict Search was a drop down box under the search box to turn Safe Search off. Very unhappy with Google. What's the link for the Hacker translating page? So, it looks like they have implemented this feature and announced it on their blog. And it looks like it's all cookie based and all some clever kid has to do is clear the cookies to unlock it. Not terribly useful.